Following up on the recommendation to flee Los Angeles, let's consider Los Banos, a city (population 35,211) located in the center of the California, about two hours from San Francisco. 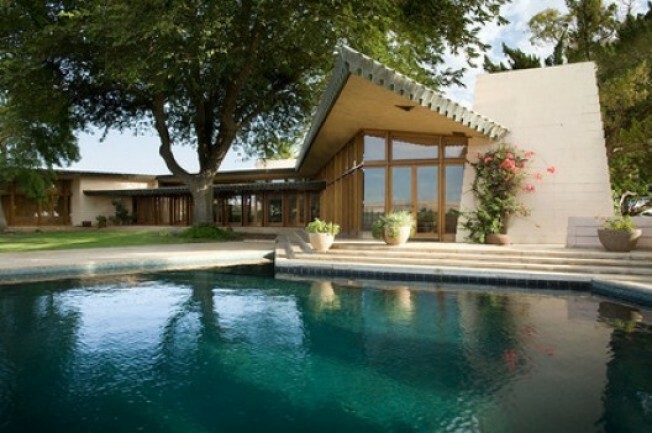 It's also where you'll find architect Frank Lloyd Wright's Fawcett Residence, a five-bedroom home built in 1961 that hit the market about a month ago. According to a recent Fresno Bee article, the home was built for Randall and Harriet Fawcett, who would later farm on the land (80 acres is included with the home). But Wright didn't have much initial interest in the area. Via the newspaper: "Wright didn't build many houses in the Valley, and he wasn't particularly excited about the prospect of this one. Thumbing through photographs of the area, he told Randall Fawcett, 'Not much beauty there.' Fawcett replied: 'Actually, Mr. Wright, the Central Valley of California contains the most fertile agriculture land in the world. you should consider it an honor to build a house there." The Fawcetts have now passed away, and their daughters have listed the home. It's yours for $2.7 million.